White Hairless Bi-pedal Ape seeks Dark Furry Companion for long embraces. Must share a common fondness for trees and eating. Clingy behavior not a problem. 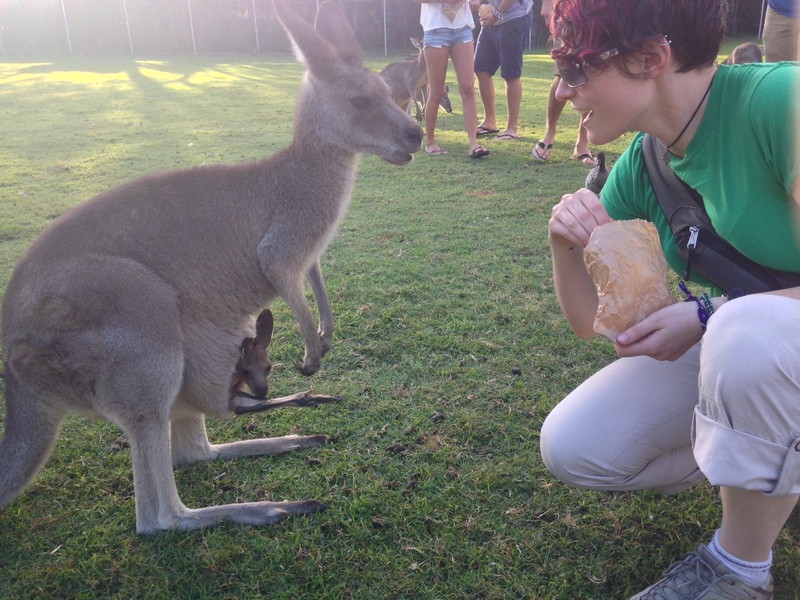 When I decided I wanted to come to Australia, I definitely wanted to experience the wildlife. 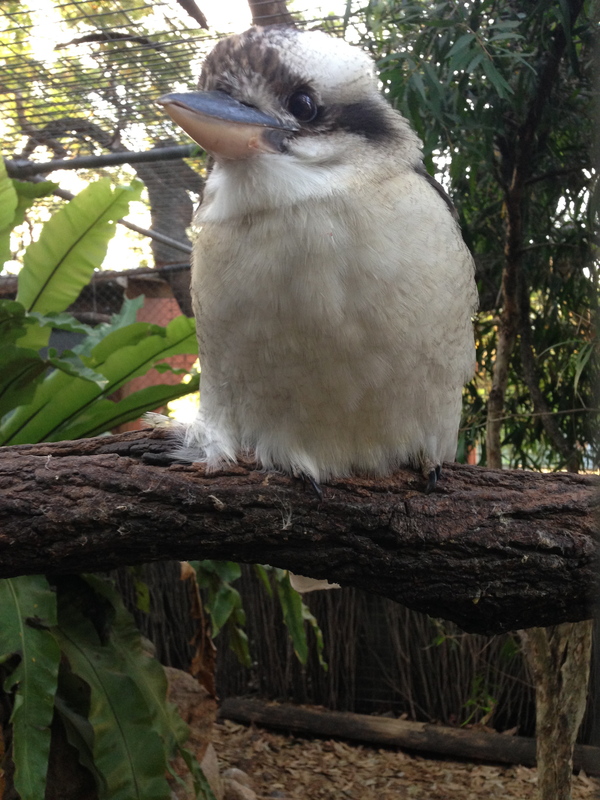 The first few days on the road, I constantly scanned the gum trees for a little ball of fluff on the fork of branch and trunk. Even if I had seen one, I still wouldn’t be satisfied without an actual koala interaction. I am not alone in this desire. Lots and lots of touristy places feature Australian wildlife with an opportunity to “cuddle a koala.” In truth, most just let you hold a koala for a millisecond while you have your overpriced photo taken. I went to Lone Pine Koala Sanctuary for my experience and was fortunate enough to have nearly no line behind me and questions loaded to extend my koala-holding experience. Lone Pine Koala Sanctuary near Brisbane, is the oldest and largest in the country and houses some injured koalas that wouldn’t do so well on their own, as well as some born in captivity. I don’t generally think of myself as an ooey-gooey person. I admit it. I like baby animals maybe even more than human babies. But I don’t go out of my way to find them. My father has a weird animal magnetism thing that I have always envied. He thinks absolutely nothing of wild animals making friends with him and letting him capture them, without injury to either. When I was a kid, he once caught a wild bird OUT OF THE AIR, WITH HIS HAND and tied a long string to its foot and let it live in our decorative indoor trees for a while. When he wanted to show it off, he would tug gently on the string and the bird would come sit on his hand. This was one of many Ace Ventura type moments growing up for me. They never liked me the way they liked him, and I’m a VEGAN! Don’t they know!?! 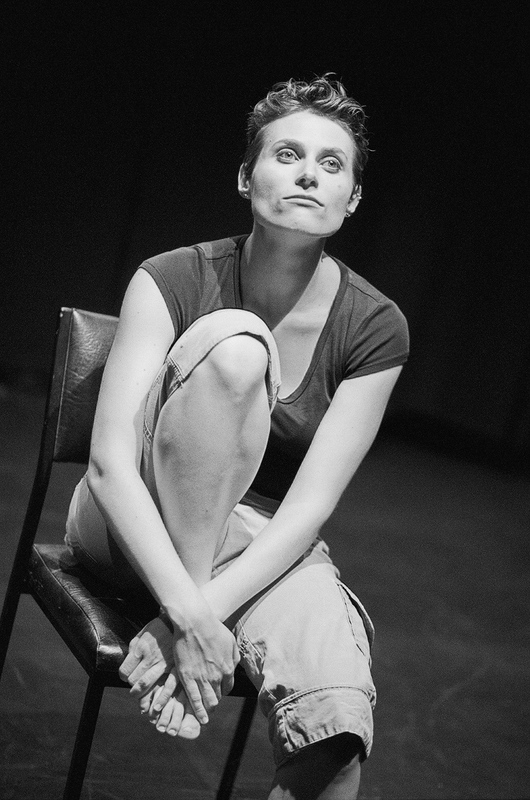 Anyway, I did not inherit the bird-whispering gene, and so I try reserve my squishy feelings for other things. 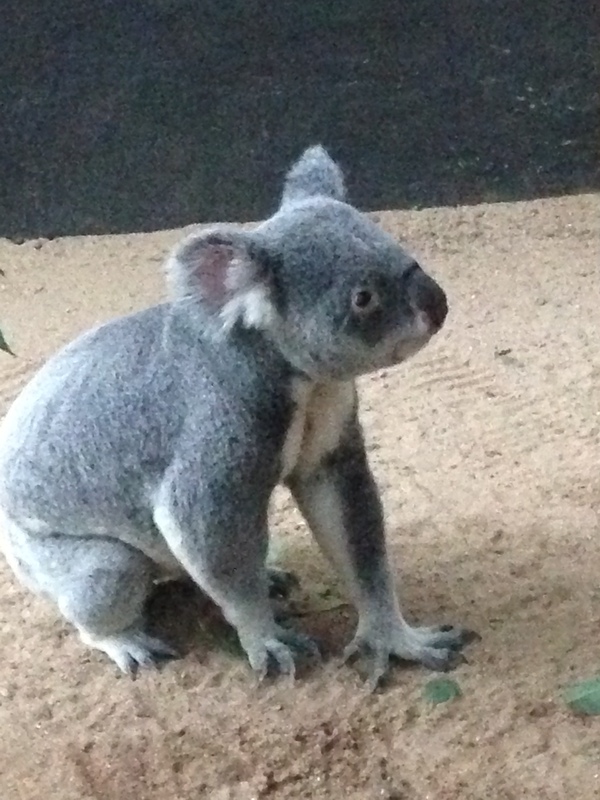 But then I saw a koala in person…and I fell apart. She looks ambivalent, but I’m in love. 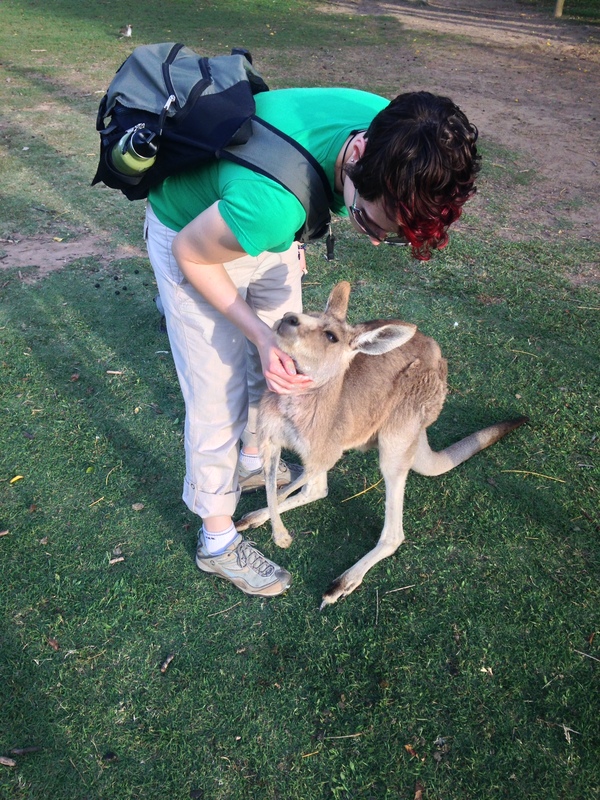 Whatever dignity and emotional restraint I had was gone in that moment of human-meets-cute-cuddly-creature. I couldn’t help it. I was lost in the fluffy ears and big nose and sleepy eyes. 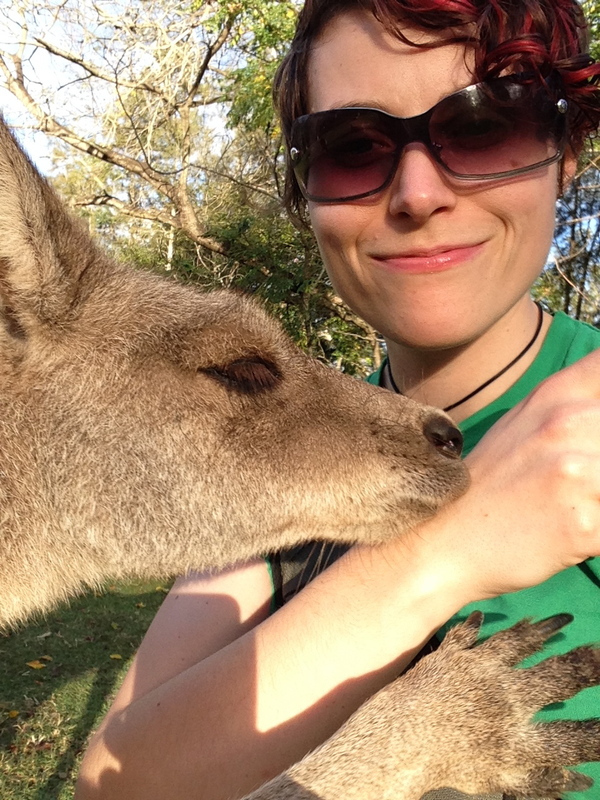 I was more in love with the one they put in my arms than any other animal I’ve had such a brief encounter with, ever. I was all “Awwww.” I looked at its soft downy face and just said “hello,” looking for the slightest bit of recognition as if this were my baby and I wanted her to know me. 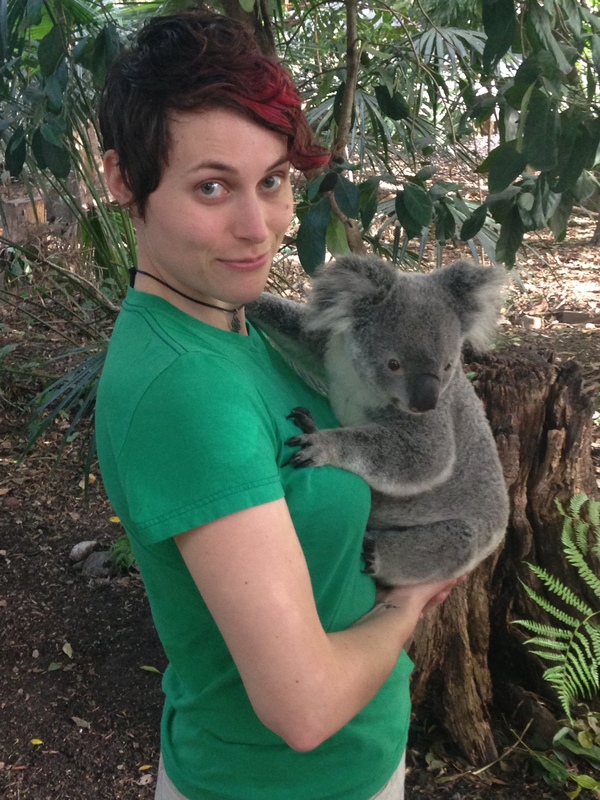 It was truly hard to give her back and realize I will never be the guardian of my own koala. Koalas are soft, and sort of dopey. They spend 90% of their time sleeping like the bad kid in class and grazing like panda bears, and they are wonderful creatures to have a moment with. Steve Irwin’s Australia Zoo is a bit further north, but they can keep their crocs. I’m a Koala Cuddler. 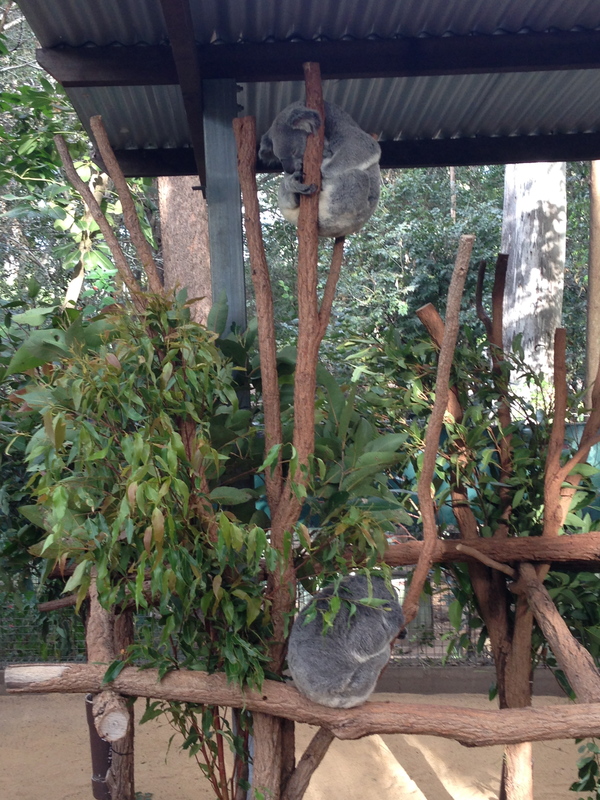 Some say that the eucalyptus makes them stoned, which may be why they do nothing but eat and sleep all the time. Eucalyptus is quite toxic, and a less than cute fact about koalas is that they pass down the enzymes to break down the plant into food and not poison, by feeding their babies their excrement. 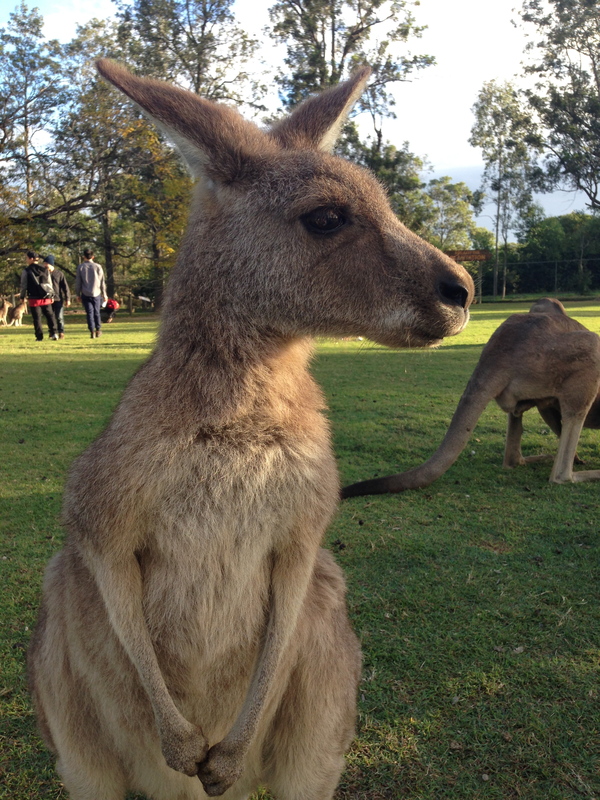 Lone Pine Koala Sanctuary also has a Kangaroo and Wallaby reserve, where the roos will let you get up close and personal…..well, uh, maybe too personal. To be fair, I had food with me. 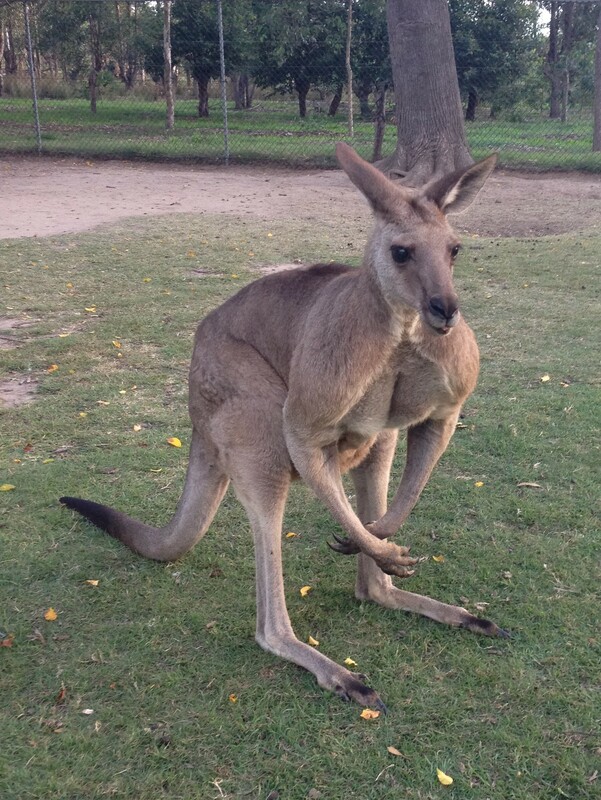 Kangaroos are definitely the deer of Australia and have many varieties. Some are demure, coy, bunny-like things, and others are the Arnold Schwarzeneggar’s of the bush. 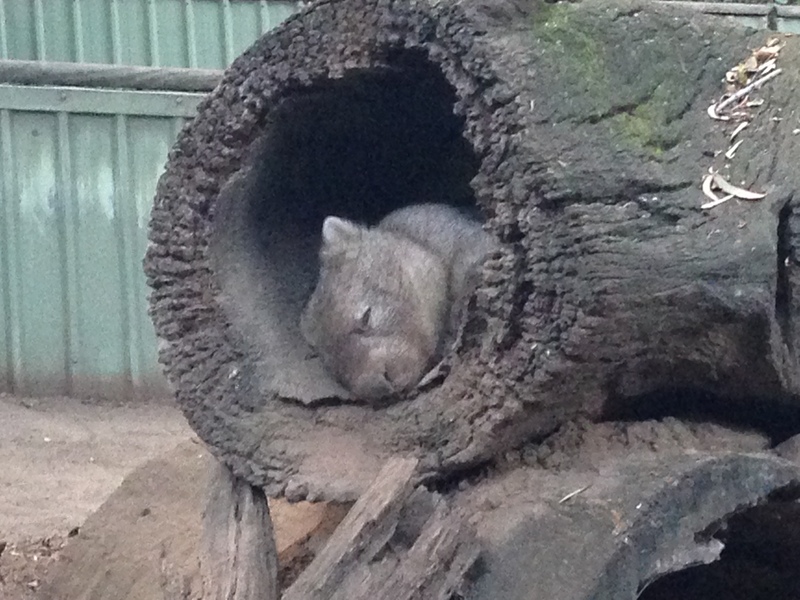 Other creatures at Lone Pine included: wombat, cassowary, Tasmanian devil, and kookaburra, and sadly, dingoes. I could not look at these creatures long in their enclosures when I’ve seen them free to roam on acres and acres of land. It’s strange too, to see birds enclosed while others of the same species are right outside the cages. I can only hope they are there because they have some kind of ailment and require help from their human guardians. I think they liked it. ← Viva Bris Vegas!…..or Entering Queensland.